This camera's design and feature set are top-notch, though the super-wide-angle lens creates some fish-eye effect. 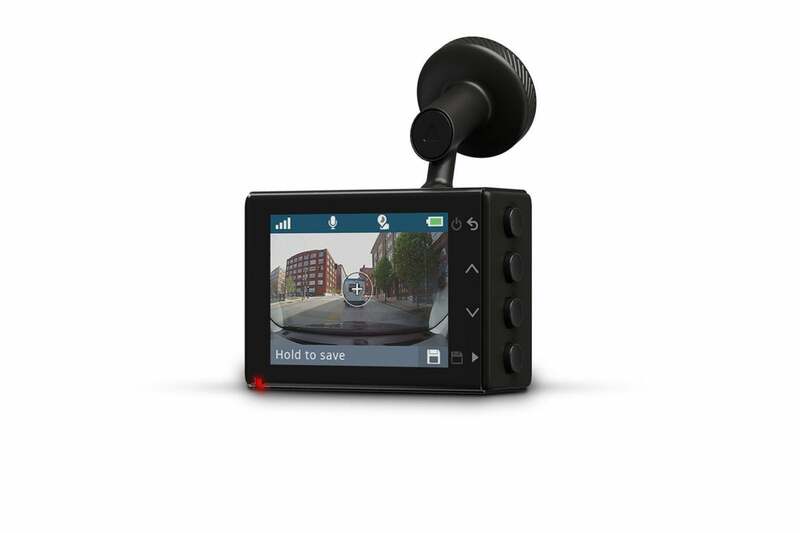 Garmin’s Dash Cam 65W has all the latest fancy features, such as voice command, red light camera warnings, bad driver alerts, GPS, and Wi-Fi connectivity. It also packages them in a nice compact design that sports a very clever magnetic mount. 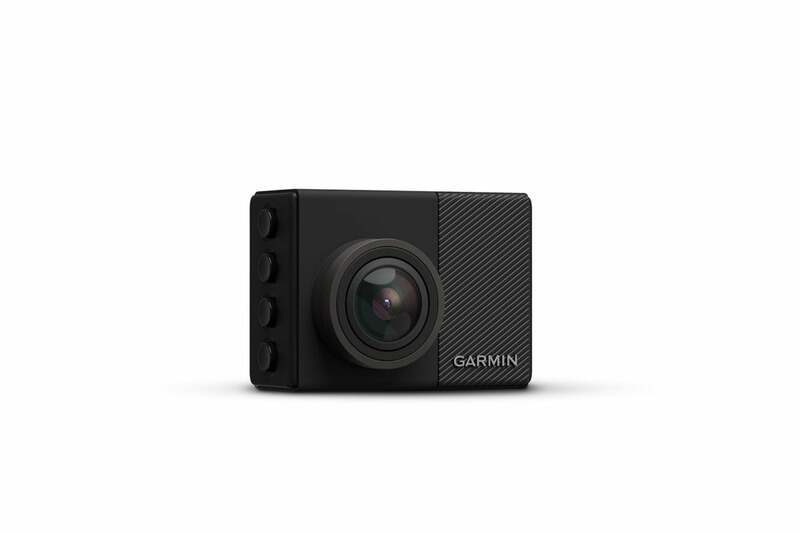 The $250 65W is basically the same camera as the Garmin Dash Cam 55 that I gave four stars to over a year ago, except that it sports a wider-angle 180 degree lens. It’s also “limited” to 1080p (which is fine) rather than 1440p video. Note that the wider lens, while capturing a larger swath of action, does impart a noticeable fish-eye effect. Regardless, a very nice dash cam on the whole. The first thing you notice about the 65W (and its 55 and 45 siblings) is its diminutive stature—approximately 2.2 x 1.6 x 1.4 inches. The three cameras are identical in appearance except for the ring of color around the lens neck: copper for the 55, pewter for the 45, and a darker pewter for the 65W. The 65W is also easily distinguished by its wider lens. The 65W’s distinguishing feature is its super wide 180 degree lens. It captures a wider field of vision, but induces some fish-eye effect. The back of the camera is given over almost entirely to a nice 2-inch display, while you control the unit and browse menus with four buttons on the right side of the unit. The only major features breaking up the rectangle are the micro USB port on the left side, and the SD card slot and heat vent on the bottom. The USB port is oriented so that the power cable (auxiliary/cigarette lighter to micro-USB) points up to the ceiling. It’s an elegant design. One of my favorites. As I mentioned up front, the 65W offers a super-wide 180-degree field of view, and takes 1080p video at 30 frames per second. That’s about the maximum size and frame rate we recommend for a normal dash cam use. There are cameras (including Garmin’s own Dash Cam 55) that support 1440p or greater, and some that capture 60-fps video. 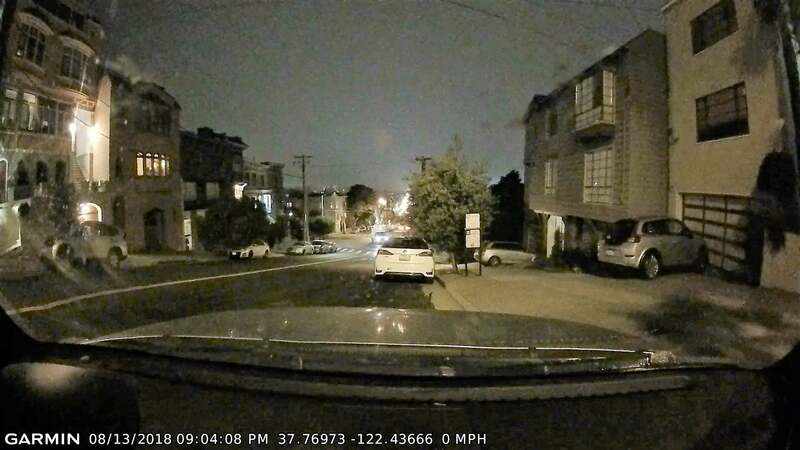 But once you figure in dash cam-grade optics and compression, you generally wind up with the same amount of detail as with 1080p/30 fps—but considerably larger files. Speaking of which, the 65W ships with an 8GB SD flash memory card, so you can get going right out of the box. The 65W uses a very clever magnetic mount and a ball socket on the camera. It’s very stable and adjustable, but doesn’t do much in the way of shock absorption. The 65W’s mount is a clever design, consisting of a small magnetic disc that sticks to the windshield, a magnet on the bottom of the mount arm that attaches to it, and a ball joint in the camera itself where the other end of the mount arm mates. It works great: it’s easy to install, it allows a wide variety of positions, and it reliably retains the orientation you set for it. On the downside, there’s almost zero flex or impact absorption. That probably helps the G-sensor detect impacts more reliably, but also most likely contributed to the jumpiness of the video that the 45 and 55 siblings, and to some degree, the 65W, experience. It’s true that my vehicle, a 2006 Mazda MX-5 (Miata) has an exceptionally stiff suspension (Ohlin) designed with both track and street use in mind. A softer-spring car, on roads smoother than most in California, may not encounter the same issues. That said, most cameras compensate better than these Garmin models do. Using the 65W is a breeze. Among the many bells and whistles, probably the most useful is voice control. 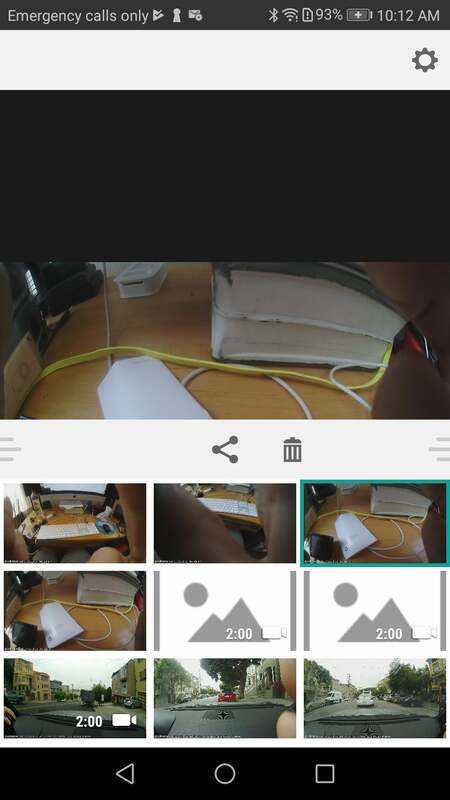 It allows you to tell the camera save a video or picture, stop recording audio, or start recording a Travelapse video. The latter, as you might guess, is a time-lapse version of events. GPS is integrated and watermarks the video, and it’s worth noting that not all cameras, including, surprisingly, the otherwise well-regarded Thinkware F800 and F800 Pro, will do that these days. 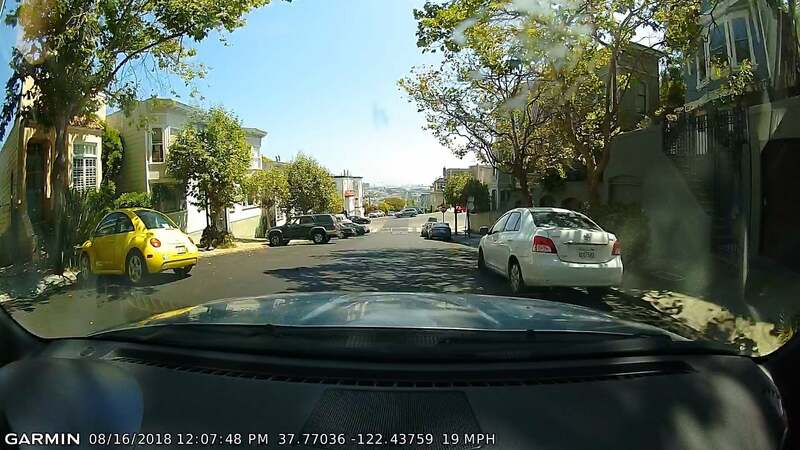 Bad driver tech includes lane departure, collision, and you’re-sitting-uselessly-at-a green-light warnings, as well as a red light camera alert. The latter is dependent upon the data Garmin has on the area, which, given its vast experience in GPS units, is broad. There’s also Wi-Fi connectivity, so you can offload your video captures to your phone using Garmin’s VIRB app (shown above). This requires connecting the phone to the 65W’s Wi-Fi hotspot, then sharing the gallery from the main menu of the camera. The phone settings (types of units, feet/meters, etc.) available in the app are minimal, so I’m hoping more will be forthcoming from Garmin. The 65W features motion detection and can be used for parking surveillance if you hard-wire it to a constant 12-volt source. You can connect the camera to the computer, but the contents of the SD Card didn’t appear to be available. Reading it requires a card reader, or of course the Wi-Fi and the app. The 65W’s video (h.264) daylight captures are sharper than average with a warm color palette. If there’s a fault, it’s the fish-eye effect induced by the 180 degree lens. I’ve seen 170-degree cameras where the effect isn’t quite as noticeable, but if you don’t want any fish-eye—don’t buy a wide angle camera. For catching action to the sides, however, it can be invaluable. Daytime video is nicely saturated and detailed, but there is a noticeable, if not necessarily off-putting, fish-eye effect from the 180-degree lens. The 65W’s video was only mildly jumpy on my local, always-under-construction roads. When I say jumpy, it’s not only that there’s motion, but a odd frame effect where part of the image appears stable, and the other is moving. That’s a poor explanation, but if you see it, you’ll know what I mean. It’s not attractive. 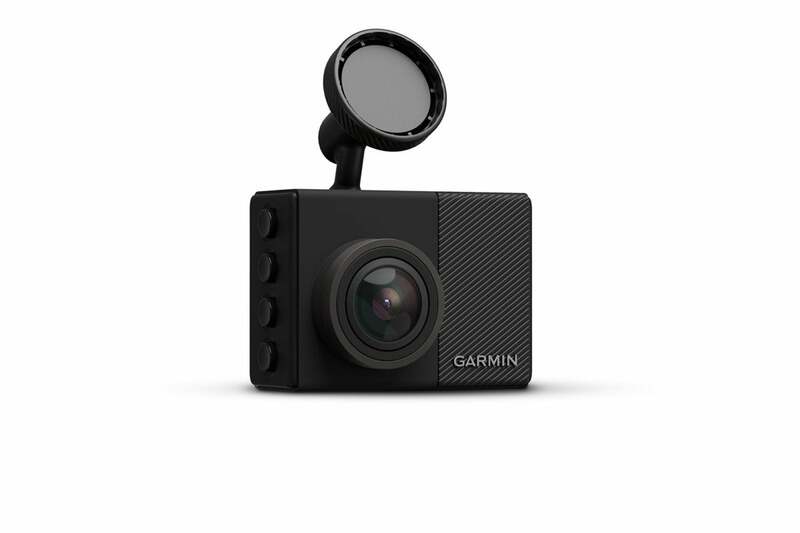 I’ve seen better, but I’ve seen a lot worse, in particular Garmin’s own Dash Cam 45. 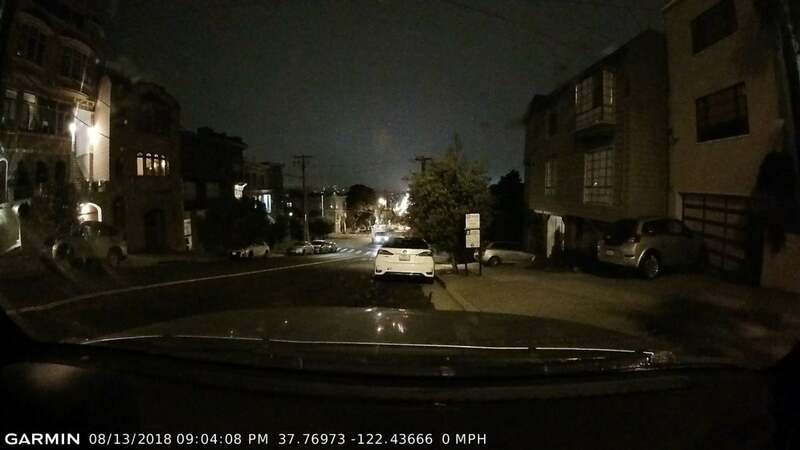 Night captures are better than average, and considerably better than the Garmin Dash Cam 45’s, but not quite as detailed as the Thinkware F800 (either the F800 or F800 Pro) or the Aukey DR01’s. The 65W takes above average night video, though detail is just shy of best in class. The headlights are not on, the light on the back of the white vehicle is from a orange streetlight behind my car. Below, I’ve doctored the night capture with extra brightness to show that the 65W does a good job of capturing detail. It’s not as sharp as with the F800 or DR01, but not many cameras are, and it’s still considerably better than average. With the brightness increased, you can see that the 65W does a nice job of capturing details at night. Note that this scene is not nearly as bright as it might seem. The Dash Cam 65W does run a little warm, most likely due to stuffing a lot of electronics into a rather small space. Like the 55, it’s not rated for extreme weather. Operating temps are from -4F to 131F. As with all dash cams, we recommend you not leave it baking in the Arizona sun. A bonus for unforeseen circumstances: The camera will run for quite a while even without a 12-volt power source. The record-after-power-loss adjustment is conservative, going up to a minute, but Garmin claimed the battery is good for up to 30 minutes. I saw a bit more than that with the display off, when restarting and running the camera without 12-volt. So yes, the 65W offers full protection in case of accident, and can also double as a handy cam should the need arise. The 65W is an excellent dash cam. You get voice command, Wi-Fi connectivity, and all the alerts you could wish for without sacrificing the display, as you do with Thinkware’s high-end stuff. It’s also far more compact. The 65W’s 180-degree field of view is worthwhile for capturing stupid pedestrians dashing out in front of you, or showing the bus trying to beat you to the inside corner. 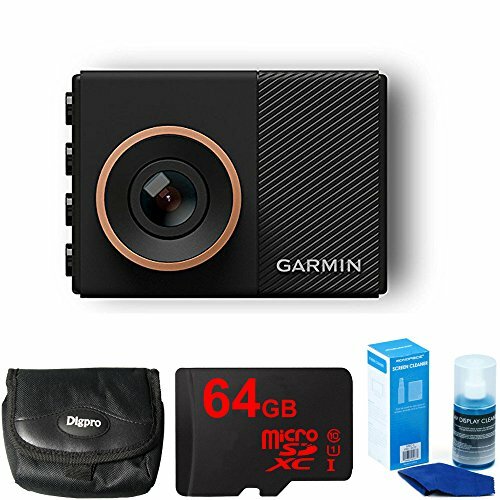 But if your needs are simpler, such as using video for documenting your travels, you can do just as well with a cheaper camera, such as the Garmin Dash Cam 55, with its narrower field of view.